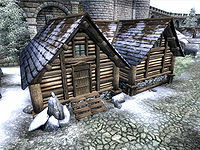 Houses in Oblivion are buildings in which you may sleep and safely store items in non-respawning containers. Each major city (except Kvatch) has a house available for you to purchase. 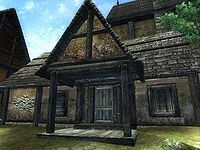 Some of the official plug-ins also add new homes, and there are even a few free homes that become accessible after completing associated quests. However, only the houses purchased inside major cities count towards your "Houses Owned" statistic. There is no limit to the number of houses you can own. Once a home is purchased and has been entered, the door is permanently unlocked (although there is a glitch associated with the Bravil house). Although it is impossible to lock the door, no NPCs will enter your house when you are not there, nor will any NPCs steal items from your house. The benefits of owning a house may not be immediately evident. There are free beds available in the game, any items left in a pile on the floor are perfectly safe, and there are even some containers outside houses that do not respawn. One main benefit of owning houses is that they allow you to be organized, giving easy access to your belongings and storage areas. Houses provide you with a regular place to sleep near your stored items, and support roleplaying situations calling for a home. Fast-traveling from within the purchasable homes in every city (except Anvil) is another benefit, especially for vampires. Note: Each price listed on this page is a Base Cost, meaning that each player will nearly always have to pay more than the amount listed, as detailed in Commerce. Warning: Immediately selling the upgrade papers after having bought them from the merchant (without ever exiting the conversation) prevents the new upgrades from ever appearing in the house. Furthermore, the upgrades will not reappear in the merchant's sales list, since you "gave" away the no-cost notes. Once you've learned that a house is for sale, buying that house becomes a quest. The quest is completed when the house and all available upgrades have been purchased. There is no need to carry the house key or the receipts from the upgrades. Upgrades are available for each house, adding furniture and other items. These upgrades can easily cost more than the house itself, by the time you've bought them all. One unusual property of these houses is the fact that you can fast travel from the interior of all these houses, except Benirus Manor. Upon purchasing Benirus Manor in Anvil, you will notice that it is in disrepair inside and out; however, after you complete Where Spirits Have Lease, the house will be restored to its former beauty. During the quest, ghosts can be found within the house. Even after its restoration, it's a little dark inside, but it has a balcony, a loft office upstairs overlooking the sitting area, thirty-three containers in the basement, and a secret chamber (related to the quest). Note that you should not use this house for storage before completing the quest, as any items in the house will be lost when the house is repaired. Once you've completed the quest however, all the containers are safe to use. Note that the remains of the ghosts you encounter on the quest stay in the house for a while but do go away eventually. Benirus Manor is the only house for sale in the cities that uses a quest to renovate/furnish it, and not purchasable upgrades. See the Benirus Manor article for additional information. † The note for the storage area states that you only receive one chest when you purchase this upgrade. However, there are actually two chests that come with this upgrade. The house in Bravil is in the south part of town, over the bridge and then to the left, on the south side of the canal below Luciana Galena's house. It's the bottom floor of a two-story house and is very small; not much better than the Imperial City shack, but it does have twice as much floor space. The Count himself admits it's small. 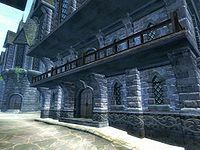 A good choice if in the Thieves Guild; the fence Luciana Galena lives above. See the Bravil House for Sale article for additional information. There is a minor glitch that prevents the player from completely owning the house: there will always be a red (trespassing) icon when you open the front door. However, you will never be arrested for entering the house and you fully own the interior of the house. This can be corrected by using the console, clicking at the door and then typing SetOwnership. †: The Upper Storage Area upgrade also adds a painting that is not mentioned in the note. ††: The note for the Upper Wall Hangings states that you receive five paintings; however, only four are added to the house. 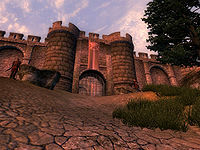 The house in Bruma is immediately to the right when entering the town from east gate. In a word, this house is cozy. It is medium-sized and in good condition. It has a cellar with a bedroom and will actually be very nice once all the upgrades are purchased. It is however a little dark, even when fully furnished. 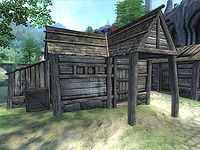 This house can also prove helpful to thieves as it is close to Olav's Tap and Tack where the Thieves Guild fence Ongar the World-Weary likes to drink. Ill-gotten gains can be stored in your house and taken across the street to sell them to him. Also, despite being in the coldest area in the game, this is the only house that doesn't have a lit fireplace. The house in Cheydinhal is located at the far southwestern tip of the city. If you stand just outside the Mages Guild, you can see it directly in front of you across the plaza. It's bigger than all the cheaper ones and looks to be in very good condition - pricey too, though. Once fully furnished, it will look great inside. The main benefit of this house is that there are thirteen containers on the second floor: seven crates, barrels, and chests in a pile in front of the staircase, two cupboards on the other side of the staircase, and four bureaus and chests in the bedroom. Unlike many other houses where you have to run around the entire house to empty your loot, these thirteen containers are all laid out conveniently. This along with many, many shelves have led some to the conclusion that it is one of the best "real" houses in the game ignoring price, second only to Rosethorn Hall. For only 15,000 septims, it is a good alternative. The ground floor of the interior does not extend as far to the north as the exterior suggests. 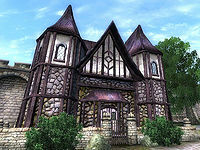 Arborwatch is the house for sale in Chorrol's Great Oak Place, next to the Mages Guild Hall. It features a sitting area, study, kitchen area, and dining area on the ground level. It also has two upper levels; one houses a servant's quarters as well as a bedroom, while the other is a master suite. Completing A Shadow Over Hackdirt grants a disposition of 100 with Seed-Neeus which helps with prices. Note that, while one upgrade available for purchase is "House Servants Quarters", no help-for-hire is available for this house. See the Arborwatch article for additional information. 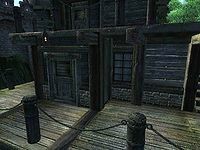 The Shack for Sale in the Imperial City is located in the Waterfront District, and is nothing more than a small pitiful shack, but does have a bed where you can sleep and level up. The upgrades are rather pathetic as well, but you will likely need the storage extension, because the basic house comes with zero containers. The Kitchen Area upgrade also adds some storage. The crate outside the house is not safe for storage. It is also perfect for people with large bounties and a need to avoid all guards until you can meet up with a Doyen. You can fast-travel to Dzonot Cave just west of the Temple District, and from there it is only a short swim to your house. See the Shack for Sale article for additional information. The house in Leyawiin is in the east of town next to the castle, where many other homes are. It is somewhat bigger than the cheaper shacks, but looks very rundown and ugly, especially next door to the huge and beautiful house of the wealthy Rosentia Gallenus. The interior of the home is rather bland and unimpressive, even after all interior upgrades have been acquired. Considering the price of the property and its size (barely larger than the Bravil shack yet 3,000 gold more expensive), it is debatable whether this house is worth the 7,000 gold you will have to spend on it. 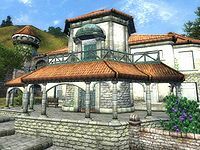 The house in Skingrad, called Rosethorn Hall, is in the eastern part of the town and is the grandest (and most expensive) home that can be bought. Rosethorn Hall was formerly owned by Vandorallen Trebatius, but he is "evicted" when you buy the house. A housekeeper is available for hire upon purchase of the Servants Quarters upgrade. 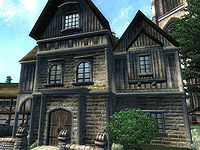 See the Rosethorn Hall article for additional information, including the three quests related to this house. 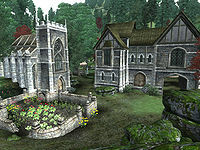 These houses and their associated quests are introduced upon installing and loading the official add-ons. The associated quest pages explain how to fully own each house. Armorer skill boost while standing next to the forge. This is the castle from the Fighter's Stronghold official plug-in. The associated quest is required to claim it as your home. It is designed for warriors and combat-based characters. The castle has three "hidden" doors. The easiest can be found by exploring the basement - a door at the back of the wine cellar leads to a hidden pillar door on the main floor. The second is a hidden pillar door at the back of the private quarters. This door leads to a small "storage vault" with three chests, two barrels, a box, and a jewelry case. In the ceiling is a trapdoor that leads to the roof where you will find a steel bow, arrows, and some mugs, presumably for drinking and shooting from the roof of your castle. There is a journal on the top of a bookcase that leads you to the third secret door, behind the archery target in the weapons room in the basement. Use the unlit wall candelabra to the right to open the door. Travel through another hidden pillar door to fight the skeleton and lich that inhabit the castle's grotto. This is not a house in the traditional sense, but Deepscorn Hollow, from the Vile Lair official plug-in. A quest must be completed to actually own it. It is tailored for "evil" or "criminal" characters. This house is for those that wish to live like the Dark Brotherhood but do things their own way. 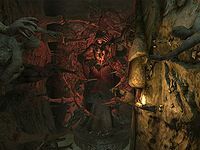 The "lair" is in a very hard to reach area of the map in a swampy area, and is decorated with interesting and morbid items. When the upgrades are completed, you have the perfect house for a vampire assassin. The Shrine of Sithis can cure illnesses if your Infamy is too high to use temples, and the Font of Renewal can cure vampirism. It offers many poisonous plants, some unique. You can even send out a Dark Minion to "kill in the name of Sithis" for you, storing the items of the victim in the lair's chest, though this will earn you an infamy point. 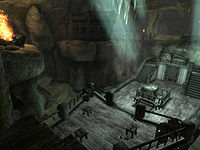 It is possible to obtain and use all the lair's benefits except the Shrine of Sithis and sending the Dark Minion out without earning any infamy points. The Gray Cowl of Nocturnal may be used to circumvent these restrictions, but a character concerned with keeping his or her infamy at zero is unlikely to have obtained the cowl. This is not a house in the traditional sense; this is Dunbarrow Cove from the Thieves Den official plug-in. This "house" is particularly well suited for thief-type characters. It may be slightly difficult to reach if your character is heavily burdened. To obtain this as a base of operations, you must complete a quest and purchase all the upgrades. It offers five merchants, one of whom is a Spell Merchant and one of whom is a Fence; they also offer training in Speechcraft, Mercantile, Security, Marksman, and Sneak. The cave contains both Cairn Bolete Cap and Wisp Stalks - useful in making both healing potions as well as damaging poisons. Outside the cave entrance and along the coast nearby are Sacred Lotuses, Water Hyacinths, Lady's Mantles, and some Aloe Vera plants. All of these are very useful in making potions and poisons. The upgrades for this "house" are all fixed prices; haggling is not necessary. The cove also comes with pirates who you can direct to go out and "plunder"; they will give you a share of the profit after they return. This is not a house in the traditional sense; it is Frostcrag Spire from the Wizard's Tower official plug-in. It is particularly well-suited for mage-type characters and characters that prefer solitude, but it also for any character that does not want to join the Mages Guild but wants access to custom spells and custom enchantments. Some players may want the tower simply for the view. To use all available features of this "house", you must complete the associated quest. Even with no upgrades, the tower contains a wide variety of plants to harvest, including those only available in Oblivion and Mankar Camoran's Paradise. Once you have completed the Knights of the Nine quest line, you can safely use the Priory of the Nine as a house. There are multiple available beds to sleep in and all the chests and containers in the Priory are non-respawning. However, do not use any of the second floor chests other than in the bedroom before completing the associated quest line: as the Priory is being cleaned up by the other knights, several containers vanish completely. After the Priory is restored, it is safe to store items in any container for the remainder of the game. Beware though; the other knights may take books to read and ingredients to eat, especially if you drop them on the floor. You can also use the crates outside for safe storage. Note: Free "Houses" must provide the player with a place to sleep and all containers in the sleeping quarters must be safe (non-respawning). After you have completed Zero Visibility, you will get a free room at the Aleswell Inn as a reward. The drawer within that room can be safely used for storage (but the other containers in the building cannot). There is also a small bedroll in the room that you can sleep on. 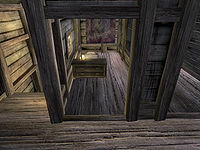 One thing you should keep in mind however is that some of the inn's regulars enjoy hanging out in your room, thus often making it tricky for you to enter or exit. The Aleswell residents may take stolen property out of your drawers. If you travel to Leyawiin you will hear rumors about Mazoga. Her questline can be started by speaking to Count Marius Caro at Leyawiin Castle County Hall. One reward for completing the second of the two quests is the key to the White Stallion Lodge. You can sleep in the lodge and all the containers in the building can safely be used for storage. Your friendly Orcish roommate will only eat the food, and will often leave to hunt Black Bow Bandits. You can follow her to Rockmilk Cave, Undertow Cavern and Telepe to fight together. 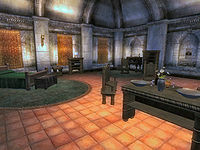 The Thieves Guild Guildmaster's Quarters contain a bed and multiple containers, all of which are safe for storage. These quarters are only accessible after you have pulled off The Ultimate Heist at the end of the Thieves Guild quest line. At that point, this room becomes accessible via Dareloth's basement in the Imperial City Waterfront District. Esta página foi modificada pela última vez à(s) 08h16min de 14 de agosto de 2015.